Why would a few degrees of warming be a big deal? 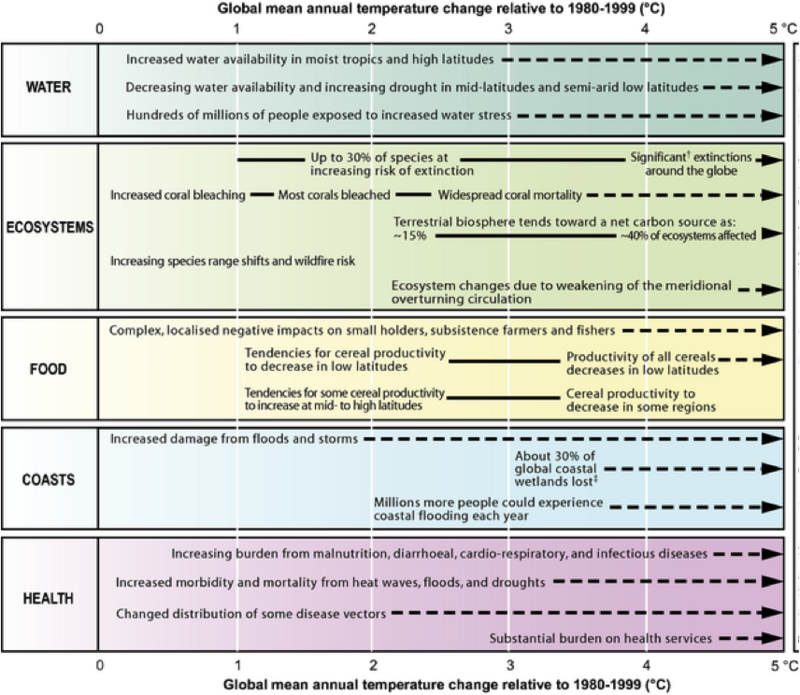 What would cause Earth’s temperature to change? 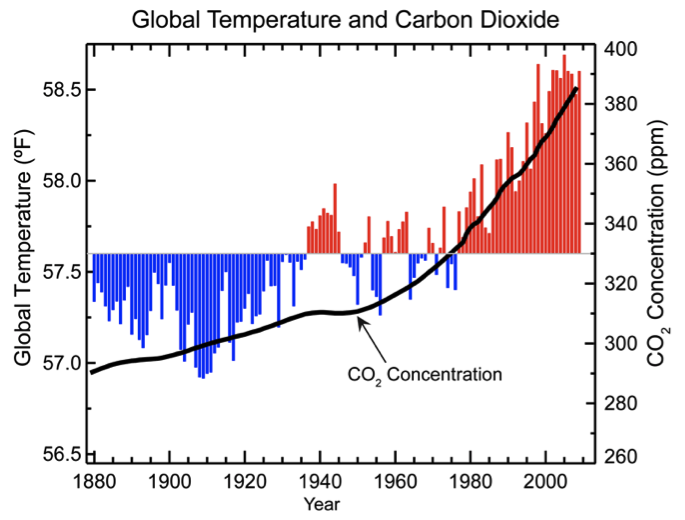 Why don’t CO2 and temperature correlate perfectly? Why do scientists think current climate change is being caused by humans? Within a few years of this discovery, it was confirmed that chlorofluorocarbons (CFCs), a class of chemicals entirely manufactured by humans, were destroying large amounts of ozone. With strong scientific backing and little resistance from industry, international action to reduce the use of ozone-depleting substances moved swiftly. The Montreal Protocol (1987) agreed to reduce ozone-depleting substances using a step-by-step approach that allowed developing countries more time to convert their technologies. Today, CFC production is almost completely phased out, and with the decline of CFCs in the atmosphere, we expect to see a gradual recovery in global ozone and a filling in of the ozone hole during the next fifty years.1 Today’s story of ozone depletion suggests a happy ending , provided that we continue to follow the steps outlined in the Montreal Protocol. If controls on ozone-depleting gases had not been enacted, global ozone levels by 2050 would have been up to 30 percent lower than today, with accompanying rises in cataracts, skin cancer, and damage to animals and crops.2 While global warming is scientifically a completely different issue, there are parallels. The science relating to climate change has become solid over the last decade. We understand that rising levels of greenhouse gases are responsible for most of the recent warming, and that if we don’t reduce emissions, temperatures will continue to warm. We also realize that solutions exist today that can reduce our emissions without compromising our quality of life. If we follow the same model used for ozone depletion and work together as a society, then we can also imagine a happy ending to the issue of global warming. 1. V . Eyring, et al., “Multimodel Projections of Stratospheric Ozone in the 21st Century,”Journal of Geophysical Research-Atmospheres, 112 (Aug. 2007), D16303 (article number). 2. For a good review of the current status of the ozone layer, see the most recent version of the World Meteorological Organization/United Nations Environment Programme’s Ozone Assessment (2006). The “Twenty Questions and Answers” section provides a relatively quick update and details can be found in the report. Connections between global warming and ozone depletion are addressed particularly in chapter 5: Climate Ozone Connections, https://library.wmo.int/pmb_ged/gormp_50-faq_en.pdf. For a shorter review of ozone changes in the coming decades, see A. Tabazadeh and E. C. Cordero, “New Directions: Stratospheric Ozone Recovery in a Changing Atmosphere,”Atmospheric Environment, 38 (2004), 647-49. Because we all experience temperature changes of tens of degrees every day, a few degrees of global warming may not seem like a lot. A few degrees of change in the global surface temperature can, however, indicate a drastic change in the Earth’s climate. This can be exemplified by considering climate changes of the past. The last ice age, for example, was characterized by permanent glaciers over much of North America and Eurasia despite the fact that the Earth was only 5°C-8°C cooler than today. Also, more recent fluctuation in global climate over the last 2000 years have been characterized by temperature swings of only ~0.5°C but have had large enough effects to receive names like the “Medieval Warm Period” and the “Little Ice Age”. This episode explains when and how the climate has changed before and how it differs from current climate change. This episode explores the factors that would cause the Earth’s climate to change. This episode discusses the factors that explain why carbon dioxide and temperature don’t correlate perfectly. This episode defines climate and weather, and provides a brief introduction to climate change. – Why is climate so difficult to understand? This episode examines how the Earth’s atmosphere transmits electromagnetic radiation, and how certain molecules in the atmosphere cause we we call the greenhouse effect. – Why is Venus’s surface temperature so much higher than Earth’s? This episode investigates systems and feedbacks to understand how climate operates. – What is a complex system? This episode provides an introduction to the sun, energy and radiation. This episode investigate the composition of the atmosphere, its layers: troposphere and stratosphere, and how they make life in earth possible. – Other gases: CO2, O3, Ne, He, CH4, etc. This episode defines energy and introduces the different energy resources. This episode investigates the Earth’s carbon cycle, and how it has been affected by human activities. This episode examines factors that affect regional climate, including altitude, latitude, mountains, proximity to oceans, axial tilts and pressure systems. – External or internal factors? Can these be affected by humans? This episode explores the role of the ocean on the global climate, including ocean composition and circulation patterns. – Can humans change the ocean pH back to normal levels? This episode explores how plate tectonic affect climate, including the formation of mountains and volcanoes. This episode continues our investigation of current climate change by exploring the climate of the past and the techniques used to do so in present day. – What types of proxies are there? 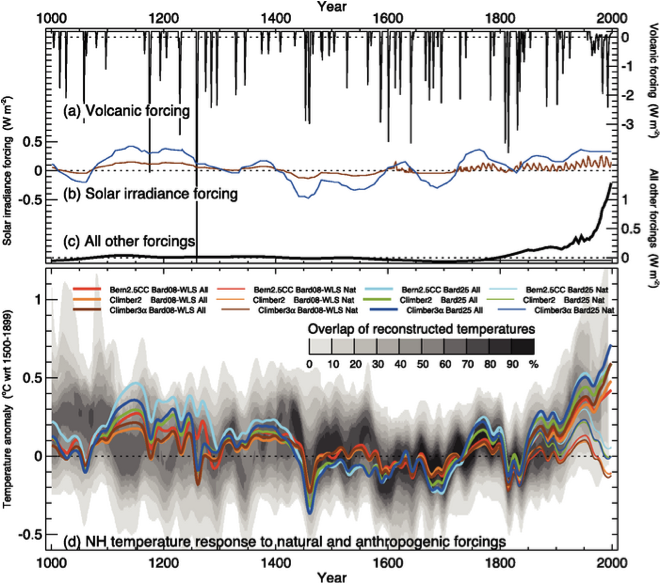 This episode reviews how the climate has been undergoing an accelerated change in the last couple hundred years, and it pointsout the evidence that suggests certain human activities are contributing to it. This episode summarizes the geology and geography of petroleum and typical exploration and extraction techniques. – Why is oil concentrated in the Middle East? This episode explores the critical energy crisis that modern society faces, also known as “Peak Oil”. This episode talks about the pieces of evidence that indicate that the Age of “Easy Oil” is over. Additionally, unconventional oil resources are explored. – petroleum is nonrenewable: how can we respond to the end of easy oil? The main reason has to do with the fundamental physics of the greenhouse effect. Greenhouse gasses are transparent to solar radiation but are relatively opaque to terrestrial radiation. This means that greenhouse gasses inhibit the Earth’s ability to radiate energy to space. Therefore, all else being equal, a higher atmospheric concentration of greenhouse gasses should work to warm the Earth’s surface. Observations corroborate this idea by showing that the Earth has indeed warmed as the atmospheric concentration of greenhouse gasses like CO2have increased (figure 1). The Earth’s climate over the last 4 billion years has changed many times. The swings between warmer and cooler climates are well documented from records such as ice cores or the thickness of tree rings, and indicate that periods of warm and cold climates can last for hundreds or thousands of years.1 These records also indicate that seemingly small changes in global temperature are the difference between an ice age and warmer periods like today. For example, 20,000 years ago, Earth’s average temperature was about 8 degrees F (4.4 degrees C) colder than it is today. That was during our last ice age, when North America was largely covered with ice.2 Step back a further 100,000 years, and the temperature of the Earth was warmer by about 3 degrees F (1.6 degrees C). Most of the Earth’s ice had retreated toward the poles, and sea level was at least twenty feet (6 m) higher than today. 3 So based on historical records, a few degrees difference in the Earth’s global temperature can have a big impact on the planet. 1. The use of tree rings, ice cores, coral reefs, and even historical records such as the time of grape harvest all provide information about the past climate. Information from the NOAA paleoclimatology division provides a good introduction. https://www.ncdc.noaa.gov/paleo/paleo.htmll, accessed May 8, 2008. 2. The last ice age was caused by a decline (2 watts/m 2 ) in the surface radiation budget due to orbital variations and feedbacks associated with carbon dioxide and ice sheets. See chapter 6 of the 2007 IPCC report and references therein for details. IPCC, Climate Change 2007: The Physical Science Basis: Contribution of Working Group 1 to the Fourth Assessment Report on the Intergovernmental Panel on Climate Change, S. Solomon, et al., eds. 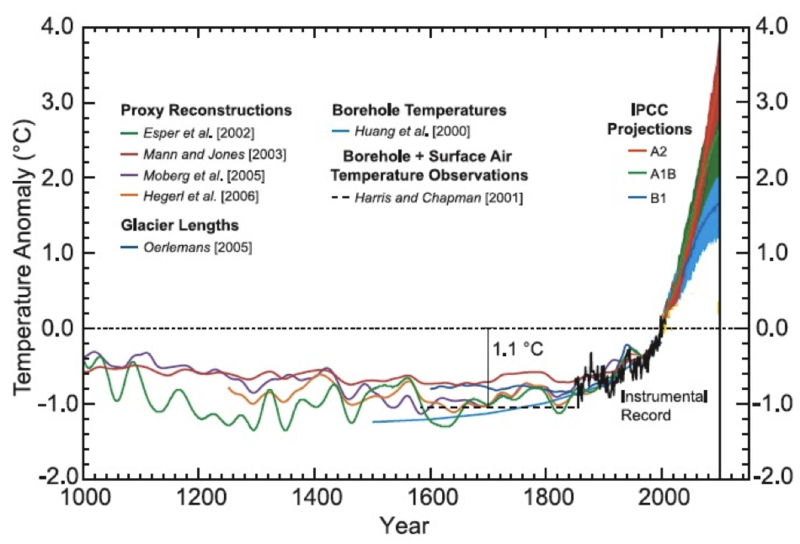 (Cambridge: Cambridge University Press, 2007), https://www.ipcc.ch/report/ar4/wg1/, accessed May 8, 2008.
or for a good plot of temperature and carbon dioxide over the last 650,000 years, see Figure TS.1. from the 2007 IPCC report. IPCC, Solomon, et al. (2007).